As a child, Liz Ward worked in a soup kitchen. Later, she zigzagged across the country each summer in a VW van, cooking for Grateful Dead concert-goers. She ended up on Vashon Island, living off the grid in a house she built, growing organic food. Today, Ward’s vision – the BumbleBar – is sold nationwide, and Ward formulates and produces organic products, including gourmet pet treats, for other companies. 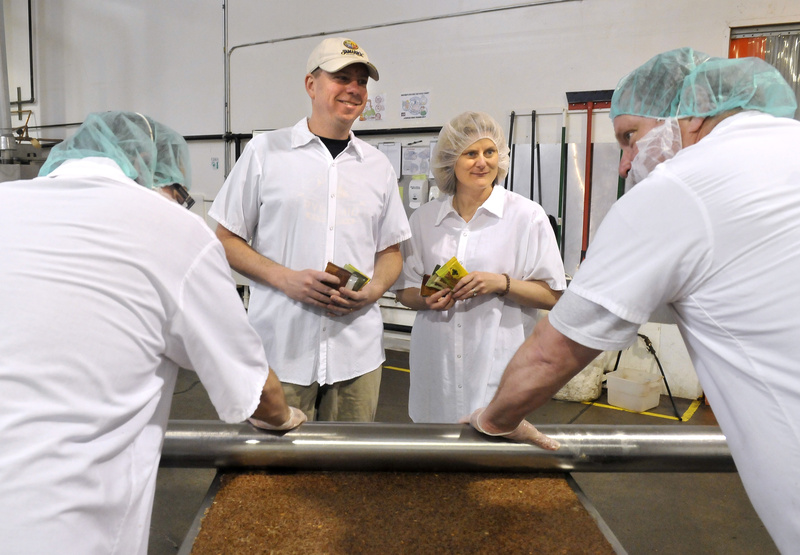 She and Glenn Ward, her husband and business partner, discussed their enterprise recently at BumbleBar’s production facility at the Spokane Business & Industrial Park. S-R: How did BumbleBar get started? Liz Ward: I noticed there wasn’t a single organic bar on the market, which seemed crazy to me. I thought the way to get people to eat organic was to make something that tasted really good. So I developed this bar and started shopping it around Seattle. Glenn Ward: Things were a lot different back then. Making the first all-organic vegan bar and selling it in recycled boxes with soy-based ink from an island off Seattle was almost communist in nature. It was very cutting edge. S-R: Did you have any nutritional or dietary training? Liz Ward: I started working in a soup kitchen when I was 8, and by the time I was 16 I was running it, cooking lunch every Saturday for hundreds of people. S-R: Did developing organic snack bars involve trial and error? Glenn Ward: Lots. For example, early on Liz came up with the idea for a bar she called Chocolate Over Chai. After we got into production, we discovered the chocolate flaked off the top of the bar, and we were stuck with bars we couldn’t sell, plus all the packaging we’d ordered. Food is an art as well as a science, and since then Liz has gained a national reputation for formulating bars. Last year she created three different ones for a pharmaceutical company. S-R: So you also produce bars for other companies? Glenn Ward: Yes, we make bars for the country’s largest national food conglomerate, as well as for people just emerging out of their kitchen. Right now, about 10 percent of our business is co-packaging – making bars for other people – but we’re hoping to grow that to 50 percent. Our newest client is Picky Bars, a Eugene (Ore.) company that caters to elite young runners. S-R: Why did you move your operation from Vashon to Spokane seven years ago? Glenn Ward: For a number of reasons. The business park here is fantastic, and the rent is a fraction of what we’d pay in Seattle. Also, Spokane’s low humidity is a perfect climate for working with sweeteners. Liz Ward: And it was a huge lifestyle choice. After our business grew and we had to move production to Tacoma, we had a two-hour commute. Glenn Ward: Here, our office is the same distance from our house, but it’s a 23-minute drive, or one hour on my bike. We loved Vashon Island, but in Spokane our carbon footprint is much smaller. S-R: Did you have a business background before you started BumbleBar? Liz Ward: I worked out of a Volkswagen van every summer for three or four years, serving veggie stir fry and organic burritos at Grateful Dead concerts, and I was importing merchandise from Guatemala. Glenn Ward: I was a sales manager with Magnolia Hi-Fi before this. I’ve been on full-commission sales since I was 16. S-R: How do you divide BumbleBar’s labor? Glenn Ward: I’m more operations – payroll, rent – and Liz is more project-based. Liz Ward: I do customer service, strategy, budgeting and developing new products. S-R: How has the company evolved since 1995? Glenn Ward: We started in a by-the-hour commercial kitchen in Seattle before moving to a 300-square-foot kitchen on Vashon Island. Then 1,500 square feet in Tacoma, and now 12,000 square feet here. As far as customers, we started with co-ops around Seattle. PCC (Natural Markets) was our first chain. After that, Fred Meyer brought us on, and then Whole Foods, which took us nationwide and into Canada. In the past three years, we’ve moved more into co-packaging, which gives us the cash we need to compete on a national level. Liz Ward: One challenge we face is that we’re out-funded. Most of the bars on the market are either hedge-funded or owned by huge food conglomerates. Glenn Ward: We produce 1.5 million bars a year. By comparison, the biggest manufacturer in our category – KIND bars – has annual sales of $110 million. S-R: Has the recession affected your business? Glenn Ward: Absolutely. Our bars sell for $1.80 to $2 each, and our competitors have put their bars on sale way more, trying to buy market share during the downturn. However, our Bloomsday sales were up almost 70 percent this year. I see that as a barometer of growing consumer confidence. S-R: Someone looking at your folksy BumbleBar label or company mission statement might imagine you working out of a thatched-roof cottage in the woods instead of an industrial park. Glenn Ward: When you make food for a lot of people, you have to pay attention to food safety and quality. You can’t do that in a thatched-roof hut. S-R: Any common misconceptions about your bars? Glenn Ward: Some vegans are shocked and dismayed because they think there’s honey in our bars, when there isn’t. Liz chose the name because bumblebees are one of the first animals affected by pesticides. She also liked the alliteration – the way BumbleBar sounds. S-R: What would you like to offer but don’t? Glenn Ward: We’ve talked about eventually evolving into Bumble Brand and not just BumbleBar. S-R: Could you outgrow Spokane? Glenn Ward: I don’t think so. This is an ideal place to grow, with its incredible blue-collar labor pool, the community colleges, and the ability to knock down walls at the business park (to accommodate expansion). Liz Ward: I love the constant learning, the problem solving. I love working with organic food for a living, and using some of the money we make to support co-ops and help build a school in Ethiopia. Liz Ward: The stress. I love what I do, but I work too hard. Liz Ward: Yoga, time with my kids, and cooking.